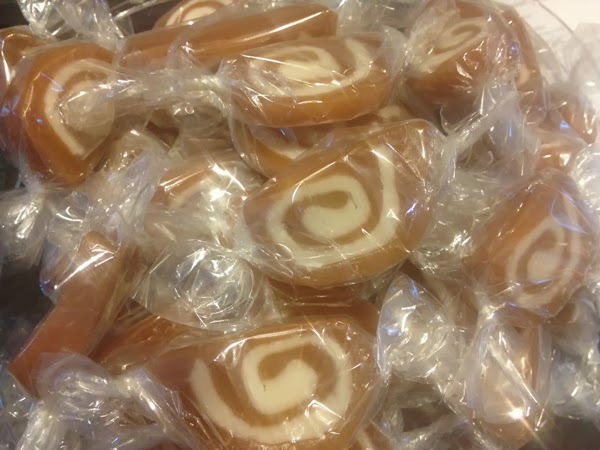 I don't know about you, but homemade caramels are about the best sweet indulgence one could ever treat themselves to. Add in that swirl of sugary creme and it is all the better. While this recipe is a bit more challenging than standard caramels, it is worth the effort. The key to making anything with caramels is the cooking temp. 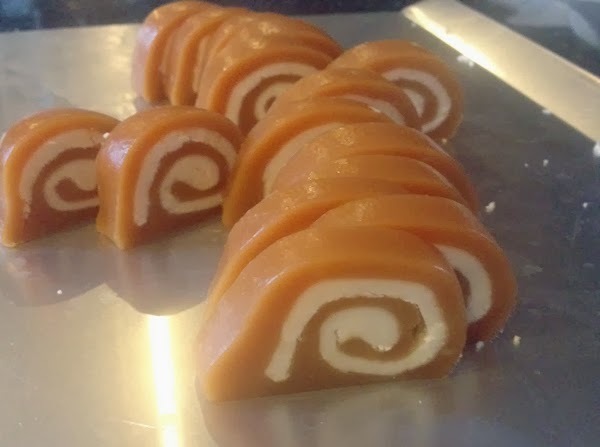 Cook your caramel to too hot a temperature and they will be too hard, too low a temperature, they will be too soft and not hold their shape. 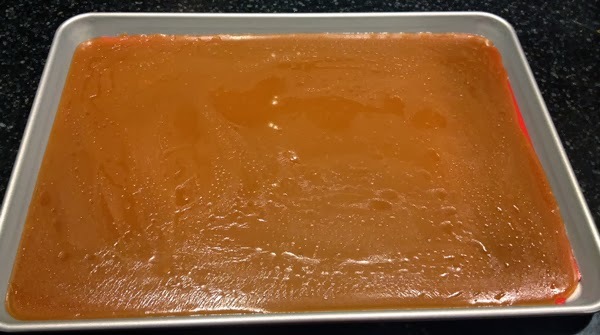 It may be a good idea to experiment with the caramels and your thermometer first to get the exact temperature for this. Large non-stick pot. The one I use is for this recipe is 5 Qt. 1. 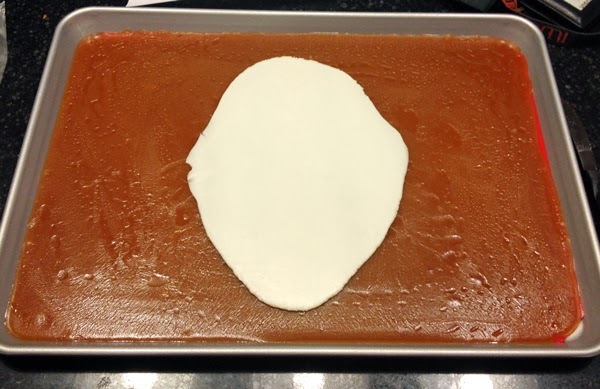 Prepare pan by placing silicone liner or wax/parchment paper into pan and set aside. 2. Reserve 1 cup heavy creme and set aside. 3. 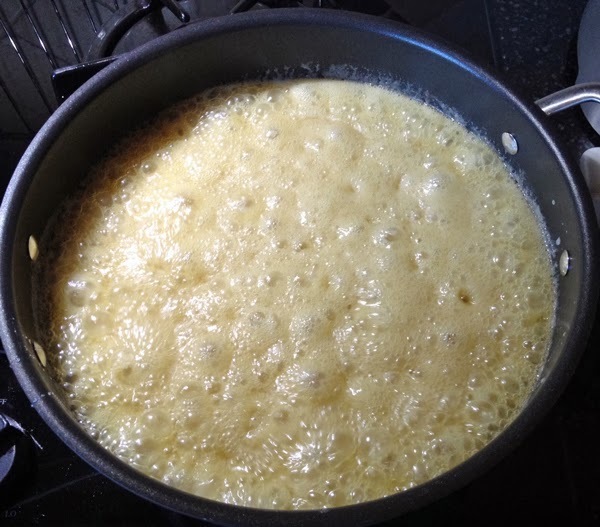 Add sugars, 1 cup heavy cream, butter and corn syrup into pan. 4. Mix until well blended. 5. Heat to boiling mixing frequently. 6. Add reserved cup of heavy creme and blend in. This will cool down the mixture. 7. 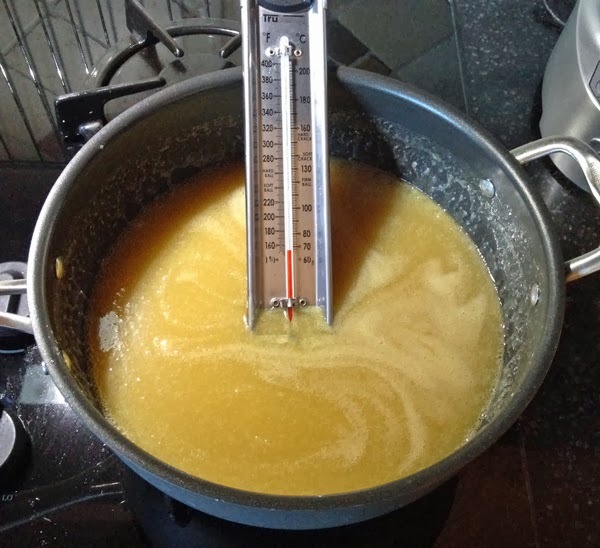 Put thermometer into caramel mixture, reduce heat and cook without stirring until temperature is 244 degrees F.
8. 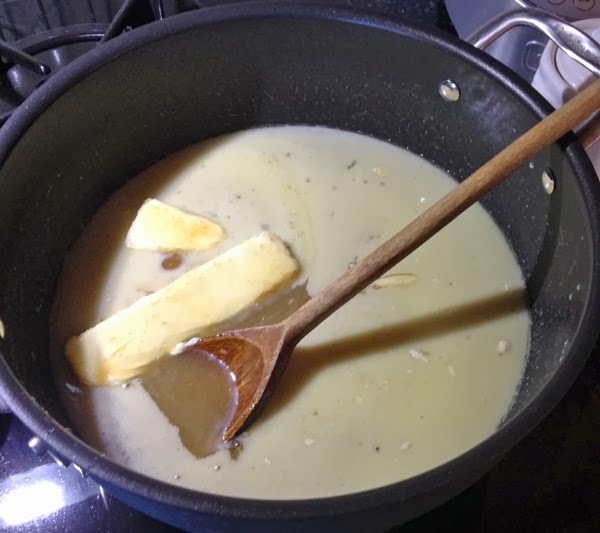 Remove from heat, add vanilla and salt and mix well. 9. Pour caramel base into prepared pan and set aside. 1. Heat sugar, water, corn syrup and salt in a saucepan until the sugar dissolves stirring often. 2. 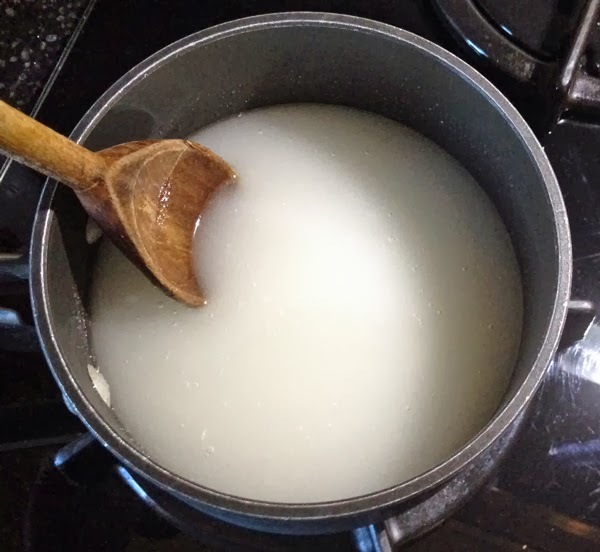 Cook until 245 degrees F. Mixture will become clear. 3. 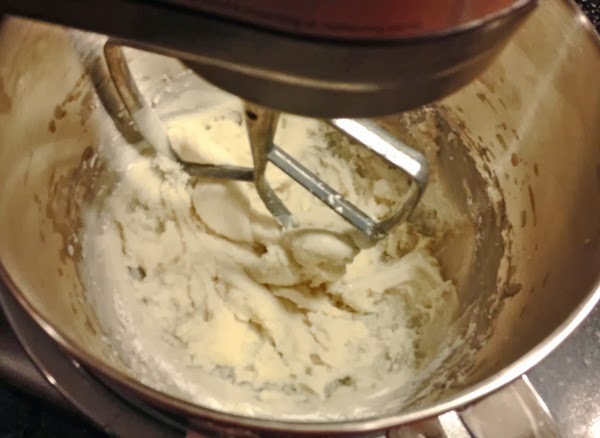 Carefully pour into the bowl of your mixer. This mixture will be very, very hot. 4. 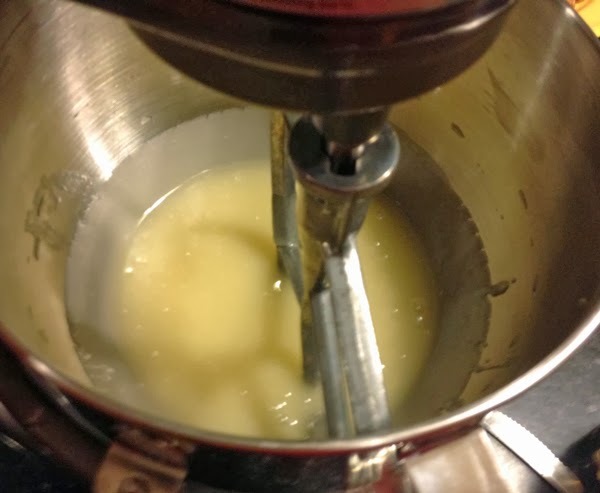 Add butter and blend on low to incorporate then medium until fully incorporated and smooth. Now we are going to layer the filling onto the poured caramel. If you can do this as a single sheet, go for it. I cannot and therefore do it in pieces. 8. 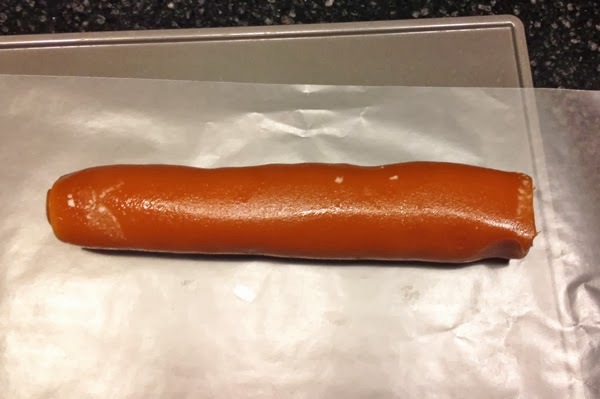 Take out a portion of the filling and place between two pieces of wax paper. 9. 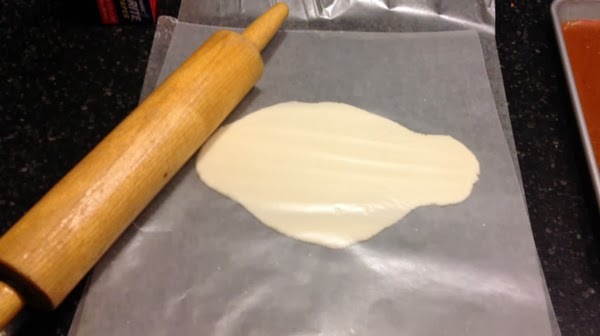 Use the rolling pin to flatten out the filling to about 1/8". 10. 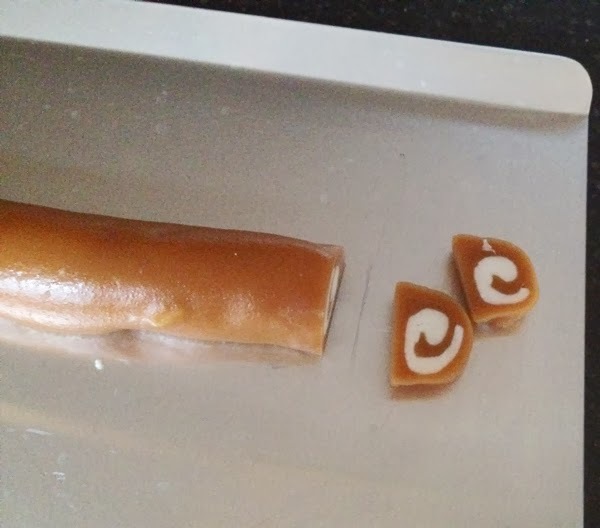 Place filling on top of caramel layer. 11. Continue to do this piecing the creme filling together on the caramel layer leaving an inch of caramel around the edges. 12. 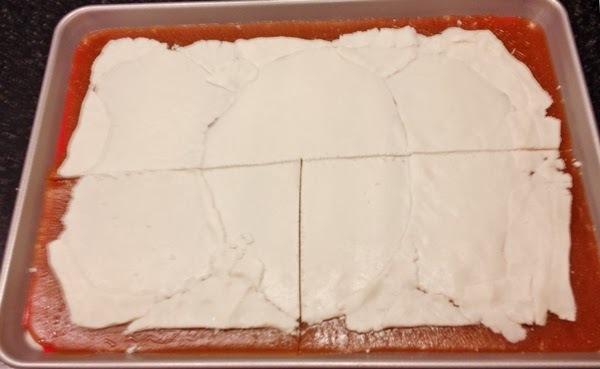 Once the filling is layered onto the caramel, cut the caramels into 4 equal rectangles (partially shown - 1 more cut is needed on the top). 13. 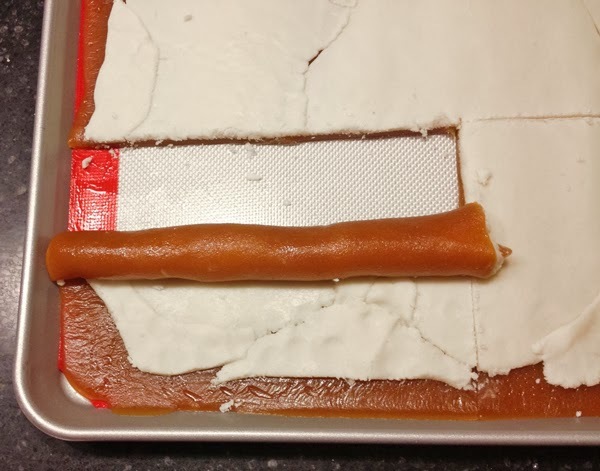 Starting with one rectangle, lift from the long center and start rolling the caramel into a log. Don't press too hard or you will flatten the roll. 14. 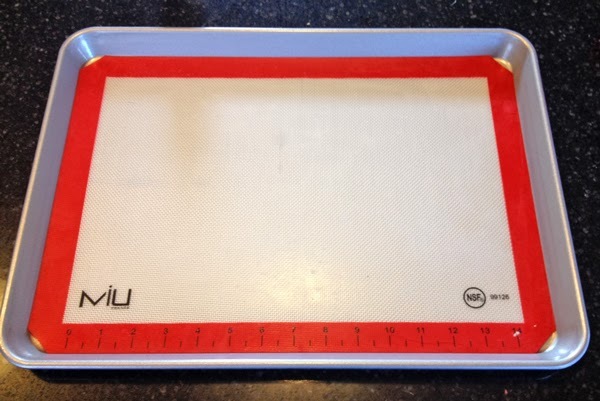 Place the log, seam side down, onto a baking sheet lined with wax paper. Repeat this for the remaining 3 sections. Always start at the long cut inner edge and roll out to the outer edge or the filling will ooze out. 15. Let the logs sit undisturbed for 12 - 24 hours. 16. Take each log and place on a cookie sheet. 17. Slice each log into pieces about 3/8" thick. If they are too thin, they will fold over and not hold their shape. 18. Wrap each piece in candy wrappers. I use these wonderful cellophane 5x5 wrappers from Caramel Wrappers. The vanilla was left out in the list of ingredients for the filling. How much vanilla?